I’m not a historian, but dlp might want to check if totem poles such as those depicted on the cover for Manitoba were carved by the Cree people. My understanding is that they are a part of west coast First Nations culture almost exclusively. Fun fact, you're right! Totem poles are primarily the cultural property of norwest indigenous peoples such as the Haida, Tlingit, and many others. Totem poles are used for everything from mortuary markers to door markers in traditional cultures. Edit: you're from British Columbia so you probably knew all that! So sorry. was certainly used only by some native tribes. issue for a mere board game. But I understand the point, especially from a Canadian view. You may think that, but you'd be wrong. This is a relatively egregious error to make, and I'm not even Canadian or Cree. Never mind cultural insensitivity, it's just plain ignorant and lazy. 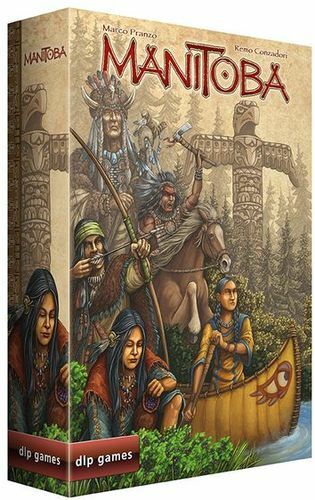 If you're going to paste a theme about playing Cree clan leaders onto a board game, at least do enough research not to completely mess up the cover art! It's a lot worse than just the cover art. The rules just got posted, and it looks like advancing along your "totem path" is a prominent game mechanic. The totem pole is tightly integrated into the game itself. I'm not Cree nor particularly well versed in this area, but I can immediately see various other weird anachronisms. The game includes "wampum belts", which I believe are an Iroquoian tradition, not a Cree tradition. The "Eagle marker" looks like a West Coast thing, not a Cree one. The "season cards" feature art that is clearly West Coast style, and some of it even looks a little bit Mayan or at least Southwestern American. It includes a "vision path" version of Cree spirituality that appears to have little, if any, relationship to actual Cree spiritual beliefs(https://www.thecanadianencyclopedia.ca/en/article/cree/#h3_j...). I'm sure people with more knowledge in this area could find many more errors. Issues around cultural appropriation, consultation and inclusion with First Nations people are big deals in Canada. Making a game about the First Nations of Canada is a really great idea, but it has to be done with a decent degree of historical research and a sensitivity to portraying their culture accurately. This game looks like they developed their "Cree" as a strange pastiche of whatever First Nations art and traditions they happen to have come across. It doesn't look like it was run past a single Cree person at any point during development. This is a really, really bad look. This post has been removed by a moderator. God I hate that term (SJW). What an insulting and dismissive way to try to end a discussion. Looking at the game description for Manitoba I had to chuckle a bit. First time I have ever heard of the 'majestic mountains of Manitoba'. We used to go up to Baldy Mountain (peak elevation 2700 odd feet) and go camping at Madge Lake. Undeniably beautiful....majestic? Not so much. edit: in case the offensive post I am referring to (in regards to the SJW comment) gets removed, I didn't quote it in my reply because it doesn't deserve to be remembered. CBC aired an interesting documentary about the German obsession with the Indigenous peoples of the Americas. Drew Hayden Taylor is an Anishinaabe comedian, playwright, and from what I can tell, all around nice guy. He sheds a lot of light on the weird obsession, and perhaps even some insight into why it can be more of a pastiche than a historically or culturally accurate representation. I think the video is only available in Canada through the link, but the article should be open to all. They've managed to squeeze just about every Native American cliche into the cover art. Totem pole, tomahawk, squaw, canoe, chief's headdress, bow and arrow. Where's the teepee and war drum? It would be too complicated to use precise historical notions in a euro game. I can only imagine the workload of an illustrator who has to take into account historical details in his work, as he was preparing the illustrations of the British encyclopedia. It would be glorious, but the percentage of people who would notice the difference are few. The question that a publisher poses is: has the time invested been repaid? Games speak to the imagination of people, not their culture. that's a pretty big cop out for racial insensitivity. If a publisher chooses to use a people's story as the basis for their game I think they should be obligated to treat it fairly and with respect. It would be too complicated to use precise historical notions in a euro game. Then don't call it Manitoba. Don't call them Cree. This is the same thing as a game calling itself "Bavaria" and the cover art including Celtic runes and dolmens. How happy do you think Bavarians would be about that? How quick and how rightly do you think they'd comment about the games cover art and other thematic elements? I almost missed this thread and posted my comment below the box cover picture instead. Glad to see I'm not alone in my surprise with how little this game theme appears to have been researched. You know, there are actually nehiyaw (Cree) people alive today that you can talk to and learn from before making a game about them. Anyway, born and raised in Manitoba and I can tell you that there are no totem pole carving nations there, nor majestic mountains. I look forward to seeing a game about Italy with a pictures of the Eiffel tower and the Russian steppes on the front. Because close enough, am I right? To me this would be equally offensive if it were a Viking themed game and they showed them with horned helmets or one set in Tang Dynasty China with Japanese armor. You pick a theme for your design, you use that seem to sell the title, then you better do some due diligence with your research. It’s not too much to expect. racial insensitivity is a serious accusation. I think there is a very different approach between us on this subject. in Europe we see tons of errors on our culture, not only in games, but also in films for example (more than 20 gross errors in Ridley Scott's Gladiator!). our reaction is much milder ... we laugh about it ... so when we make mistakes on other cultures we take it lightly, we know that it is a problem of availability of information, budget limits or even just a license to improve the performance of the product as a whole. having said this, I hope that nobody really offends, I am sure that it was not in the intentions of the publisher when he chose this setting. All of that combined with the fact that Cree people are actually alive today and have made repeated requests to stop having their culture misrepresented and appropriated. Was this game play tested with any Cree people to get their feedback? Any response to the meeples with feathers in their hair? Is there a single Viking board game where they don't have horned helmets? It is a serious accusation, I will admit. And my apologies if it offended you. Perhaps the issue is that populations on opposite sides of the Atlantic see it differently because we encounter different news sources? For example, did you know that Indigenous women and girls accounted for 10% of all female homicides in Canada from 2000-2008, while only accounting for 3% of the female population? Or did you know that a Residential School system designed to "educate" Indigenous children was geared towards wiping out "Indian culture" and only closed down in 1996 (after more than a century of existence)? I think this is why there are a lot of Canadians posting in this thread who take umbrage with games like Manitoba. We see, in our regular daily news, stories of the bad things happening to indigenous people and don't like it, and we exist in a nation that treats its indigenous people very poorly. Its very fair to suggest that "Gladiator" was a problematic film, and I am sympathetic if that upsets you. Again Remo, let me extend my apologies if I offended. Respectfully, Racial and Cultural insensitivity doesn’t presuppose intention. It’s not an argument that someone did it on purpose, but that they didn’t care enough to be bothered to learn what was appropriate. It’s particularly negative when someone is insensitive about race and culture when they are appropriating it for there own benefit. No problem, I was not offended. I'm happy to learn something new. We have no way of knowing these problems. At this point, seriously, I hope one day to travel to Canada and learn a lot about this culture. I think it might be helpful, moving forward, to suggest things that the publisher or designers could do to "enhance" the game. It shouldn't be too hard to do some research on the Cree people or even to rename the game so it reflects that pastiche of cultures that someone above was alluding to. Or reframe the game to be more obviously a product of someone's fantastical imagination, e.g., like add some elephants or cacti or tuxedo-wearing chipmunks. Or point to some games that do it better. Personally, I love Discoveries: The Journals of Lewis and Clark's blurb in the rule book: About the term "American Indians" / In this game, we have opted to use the term "American Indians" as opposed to "Native Americans". The most recent survey conducted by the US Census Bureau (1995) of Americans commonly known as "Indians" indicated the following: almost 50% prefer the term "American Indians"; well over 37% prefer "Native Americans"; over 7% preferred some other term (including those who selfidentified as "Alaska Natives"); and almost 6% expressed no preference. We have chosen to use the term by which the largest part of this group self-identifies: American Indians. It's a respect thing. Being European is not an excuse, it is exactly the point. You are picking and choosing from traditions you know nothing about and are using it for your own personal gain. Just because you don't understand the harm or feel it doesn't personally affect you does not mean it does not exist or that it is ok.
We need to start understanding we are a global community and other people and their experiences matter. Especially when they have been marginalized for so long. There are ways the designers could have done this right and they chose not to. I will not even consider buying this game because of their disregard and disrespect for the cultures they are stealing from. Let's give credit where credit's due: One of the designer chose to join this conversation. That means something. If I had been offended by all the atrocities seen in years of productions concerning Italian and European culture, I would have been hysterical for a long time. It's a game. racial insensitivity is a serious accusation. I think it says a lot when someone cares more about being called racial insensitive than whether or not they were actually being racial insensitive. OrangeWizard absolutely had the correct term. It is racial insensitivity.